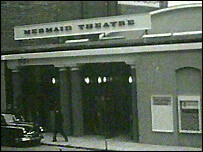 Supporters say the Mermaid could be "the jewel in the crown"
A campaign to save a respected City of London theatre from demolition has been given a last-minute reprieve. The Mermaid was going to be demolished to make way for an office block, but the Mayor of London has used his planning powers to direct the Corporation of London to refuse plans for the development in Blackfriars, central London. But he said the scheme could still go-ahead if a satisfactory and detailed £6m compensation package to help make up for the loss of the 600-seat theatre could be confirmed. A six year campaign to save the theatre, headed by Save London's Theatres, has been supported by actors such as Jeremy Irons, Tom Courtenay and Julia McKenzie. "The permanent loss of the Mermaid Theatre without sufficient plans in place to support a new theatre project is not acceptable," Mr Livingstone said. "While the Corporation has accepted the principle of a legal agreement to secure a compensatory payment of £6m for loss of the theatre, no such legal agreement is in existence and there are no clear plans on how the funds would be used to support new theatres. "The £6m would not be enough to replace the theatre but would be a significant sum to support new theatre projects." The theatre was built in 1959 using public money gathered by character actor Lord Bernard Miles and was the first to be built in the City since Shakespeare's day. Its supporters said its open-stage and single-tier auditorium became a model for modern theatre. If the development does eventually get the go-ahead it is hoped construction will begin in the next five years.